This situation occurs when you crawl a file system with up to 260 characters in the file path. This will end to ghosted files in the crawl index and can lead to lots of ErrorID 808 / 829 in the crawl database. From the user's view, files and folders over this limit will not be retrieved using Search Service within SharePoint. The problem is related on how the crawler in SharePoint manage UNC with too long path. You should preferably manage the file system environment to not go over this limit. It's a very rare condition, but you will notice no explicit evidence of this behavior if you don't suspect it. This can impact crawl performance over time if you have lots of files and folders above the limit. The problem doesn't happen in SharePoint Server 2016 but have other browser limitations. In a real world scenario, you should pay attention when crawling a file share who can exceed this limitation as many legacy applications have this limit. Why is this a problem for File Share Crawling? Why is ErrorID 808 cleaned by the deletion policy ? How to clean-up dbo.MSSCrawlURLLogs ? Solutions : How to Correct or Prevent this issue? You cannot create a file with explorer in the SUBFOLDER____MAX, because you will receive an error: "The file name you are creating is too long"
If you want to create a file beyond this limit, map a drive to a subfolder item. This will allow you to create file over the 260 character limit. The search administrator will run a Full or Incremental sync without success. Results will show you all URLs in Error. Do the same for dbo.MSSCrawlURL (crawled) and compare results. "ErrorID 808 = The object is not found"
"ErrorID 829 = The object is not found"
This is important to know that if you have an UNC Path longer than the above example : the item path (including the file extension) will be smaller. Using SharePoint Server 2016 will successfully index a file share over 260 characters in path. In the Windows API (with some exceptions discussed in the following paragraphs), the maximum length for a path is MAX_PATH, which is defined as 260 characters. A local path is structured in the following order: drive letter, colon, backslash, name components separated by backslashes, and a terminating null character. Because deep folders will not be searchable. Because this will garbage the SQL Crawl database. Each full crawl will duplicate the ErrorID 808 with all problematic files and folders. In SharePoint Server, the default policy for indexed items are the following define per Search Service Application. When the crawler encounters an access denied or a file not found error, the item is deleted from the index if the error was encountered in more than ErrorDeleteCountAllowed consecutive crawls AND the duration since the first error is greater than ErrorDeleteIntervalAllowed hours. If both conditions are not met, the item is retried. When the crawler encounters errors of types other than access denied or file not found, the item is deleted from the index if the error was encountered in more than ErrorDeleteAllowed consecutive crawls AND the duration since the first error is greater than ErrorIntervalAllowed hours. If both conditions are not met, the item is retried. The ErrorID 808 : the object is not found should be deleted according to this policy. The file is not really indexed. Different than if indexed and then deleted on the system. Since the DocID is renewed, the ErrorDeleteCountAllowed seems not take in consideration by the deletion policy. For this demonstration, we will setup the deletion of the not found / access denied item to a lower condition. This will allow you to see the problem without waiting the default schedule. Remember, this will change the deletion behavior for all your content source. Please make these modification in test or for debug purpose. $SearchApplication = Get-SPEnterpriseSearchServiceApplication -Identity "Search Service Application"
Error808 / 829 are still present in the SQL CrawlURLLogs table. $ssa = Get-SPServiceApplication -Name "Search Service Application"
This will cleanup the following table : MssCrawlUrlLog, MssCrawlHostsLog, Msscrawlhostlist for all record older than "CrawlLogCleanUpIntervalInDays"
Clean file system to not go beyond the 259(+0)-character limit in the file share. If you have too long path, you probably manage your file not effectively. Rename or Shorter Path (local) and UNC share. Mount with subst folder to shorter name. Don't forget than renaming folders or shares, will break shortcut or registry entry. However, Internet Explorer 11, will not open link to the file system with more than 259(+0) URL Length. When a user will try to open an indexed UNC file through Internet Explorer; the link will be broken and display HTTP 404 error. You can run an index reset on the impacted Search Service Application. 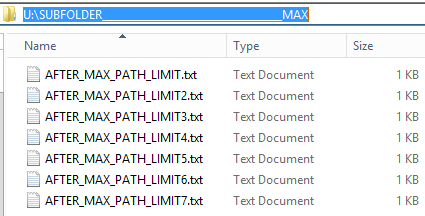 Note : Be sure to correct the problematic MAX_PATH Folder before running index reset and launching full crawl again. If you're running folder with large name, you can use the 8dot3name for crawling a content source \\server\share\%8dot3name%. This will allow you to crawl long URL for folder without any (know) impact for recent Browser or Office Applications. But this is rarely seen and you should prefer to have shorter folder name. If you encounter this issue, additional fix or re-organization may be required.